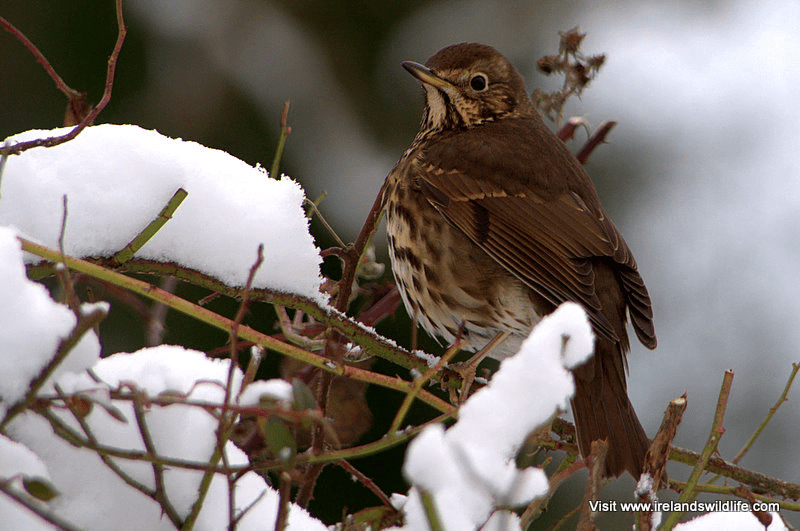 The song thrush is a familiar thrush species, and one of Ireland’s finest songsters. A key player in the acclaimed “Dawn Chorus”, this attractive speckled thrush is a familiar sight in many Irish gardens, and according to Birdwatch Ireland’s annual Garden Bird Survey features regularly as one of our top 20 garden species. This is a resident species, and is found all over Ireland throughout the year. In winter, the resident birds are joined by migratory birds from northern Europe. It occurs in woodland, farmland, hedgerows, parks and gardens nationwide. Song thrushes have a typically thrush-like body shape – similar to that of the closely related blackbird, but a little smaller. Adults song thrushes reach a length of about 23cm (c. 9 inches). Their plumage is a warm brown above, with a creamy underside heavily marked with rows of dark brown arrow-shaped spots. Sexes in this species are similar, and juvenile birds tend to resemble the adults, but have buff streaking on their backs and smaller spots on their underside. The song thrush may occasionally be confused with the much more robust and larger mistle thrush, and possibly with the overwintering redwing – a visitor from Scandinavia. However, the song thrush has a much more delicate and diminutive form that rules out its larger Irish cousin, while it lacks the distinctive white eye-stripe and obvious red wing bar of its visiting Scandinavian relative. The song thrush is a formidable singer, and has a loud, fluting, far-carrying voice. Its familiar song resembles that of the blackbird, but the song thrush has a characteristic tendency to repeat each “phrase” of the song several times before moving on to the next. Typical song phrases include a repeated “cherry dew, cherry dew, cherry dew” and “knee-deep, knee-deep, knee-deep…”. The alarm call is an agitated loud rattle or a soft “seep”-like note. Song thrushes feed mainly on insects and other invertebrates, and also take berries and fruit when in season. They are particularly fond of earthworms, slugs and snails. Like other thrushes, they are ground feeding birds, and can often be seen hopping along, then stopping dead, head cocked on one side, watching the ground intently for any sign of a prospective meal. The song thrush is famous for its unique method of feeding on snails. It picks the hapless mollusc up in its bill, then, with a flick of its head, it hits the shell repeatedly against a stone or other hard object. When the shell smashes, the thrush can get to the tender flesh of the animal taking refuge within. Song thrushes often have a favourite stone – or anvil – that they use repeatedly for this purpose. If you come across a large stone surrounded by fragments of snail shell in the garden, then you’ve found a song thrush’s anvil. Breeding takes place between March and August. The thrush builds a nest of moss and grass, lined with mud, in a tree, bush or large hedgerow. In it the female lays 4 to 6 pale blue eggs with black speckles, which she incubates for 11-15 days. The young birds leave the nest some 12-16 days later, giving the parents the opportunity to rear 2-3 broods during the course of the long breeding season. Today I have witnessed 3 song thrush younglings leaving their nests which seemed very odd to me, they could barely fly, well wouldn’t call it a flying it was more of a glide to the ground with lots of flopping. Then they just hopped around on the ground occasionally trying to fly up on a birch tree branches, few tries were a success for them, but mostly they just couldn’t reach it. I wouldn’t even think twice about this if it was one bird, I would have thought that it just fell from the nest, but since these were 3 of them I couldn’t believe that they leave the nest so quickly, while not even being able to fly. But everywhere I found information about them it says they leave the nest after two weeks, and it fits the time lapse the song thrush started her incubation period in that nest. I wonder though how will they fare, how do they fare generally what their mortality rate? Mortality rates for most young birds are fairly high Tomas. They do leave the nest quite early — but usually improve on the flying front relatively quickly. When you think about it leaving the nest as soon as possible makes sense in that when they are in the nest all of the parent birds eggs literally are in one basket — if a predator finds the nest then all of the eggs / young are extremely vulnerable. Once they leave the nest although the fledglings stay in the same area, they do tend to be dispersed somewhat — meaning that even if a predator picks off one, it won’t necessarily find the others. A thrush has built her nest in the corner of my bedroom windowsill. She laid 4 eggs and I think has started incubation now. Is this an unusual place? There is no protection. They are fine for now, but reading the above comments it sounds like they will be sitting ducks for our cats once they leave the nest. I supposecthere’s nothing I can do?